Annotation Presets can be used in the desktop article editor to ensure that the image annotations in your documentation have a consistent look regardless of who is working on writing the article. 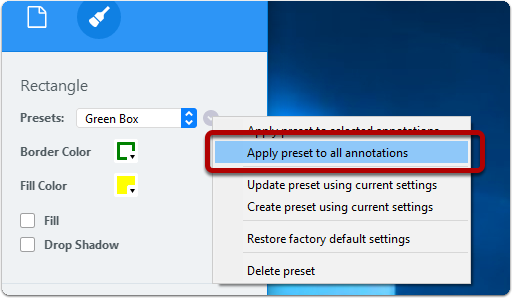 Any annotation presets you create will be available to other authors on your account the next time they launch the ScreenSteps desktop software. 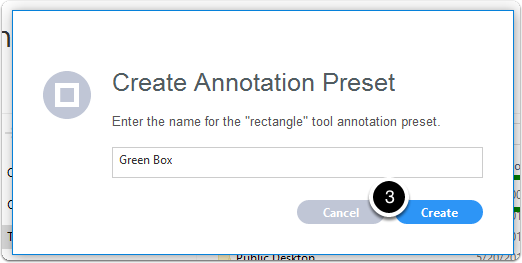 You can use an annotation preset for any of the annotation tools. Click on the button to the right of the Presets menu to display the annotation presets option menu. 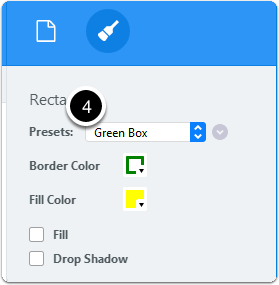 Select Create preset using current settings. A new preset will be created using the values for each property currently in use. The annotation preset will appear in the presets menu. Selecting this preset from the menu will set all annotation property values to the values stored in the preset. What does the alert triangle mean? 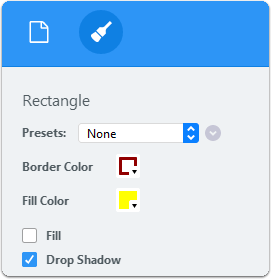 If you see a yellow alert triangle next to the annotation preset option menu it means that the current settings for the annotation tool are different than the settings stored in the annotation preset. 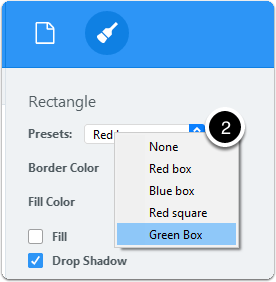 In the example below the Drop Shadow option is checked but the Green Box annotation preset doesn't have the Drop Shadow option checked. Make your changes to the properties. The yellow alert triangle will appear. 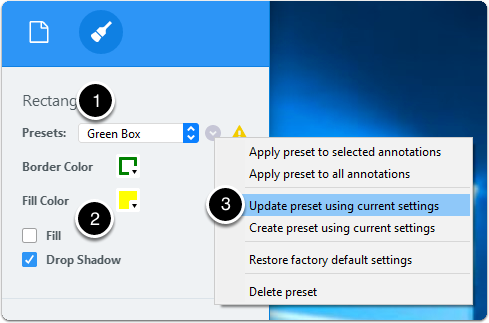 Click on the annotation preset options menu and select the Update preset using current settings option. Confirm that you want to update the preset for everyone in your orgranization. 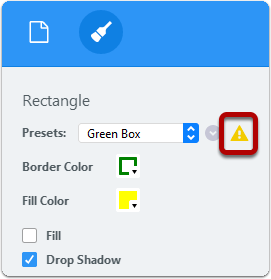 After confirming that you want to make changes to the annotation preset, the yellow alert triangle will disappear and your preset will be updated. 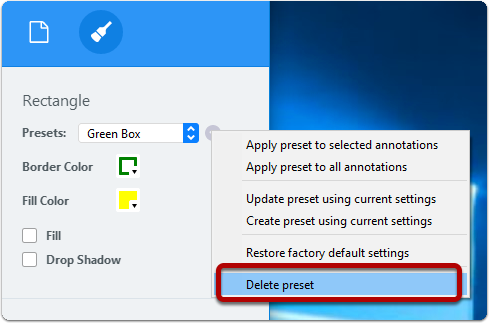 To delete an annotation preset select the Delete preset option from the annotation preset option menu. 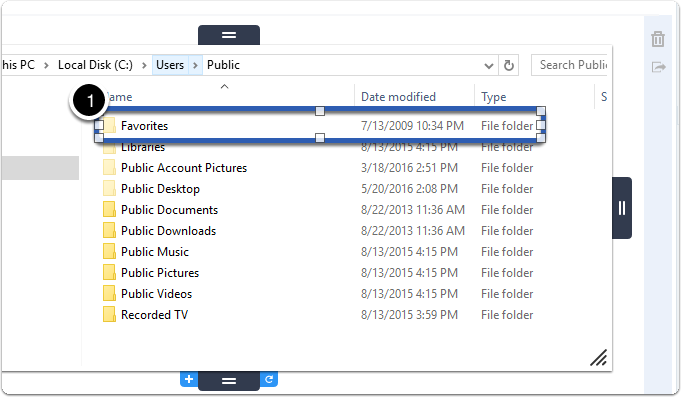 Deleting an annotation preset will delete the preset for all authors on your account. 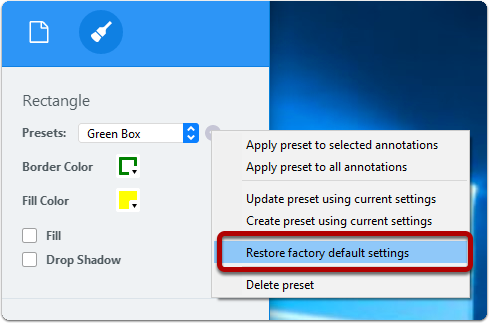 If you would like to restore the settings for an annotation tool to the settings that ship with ScreenSteps use the Restore factory default settings menu option. 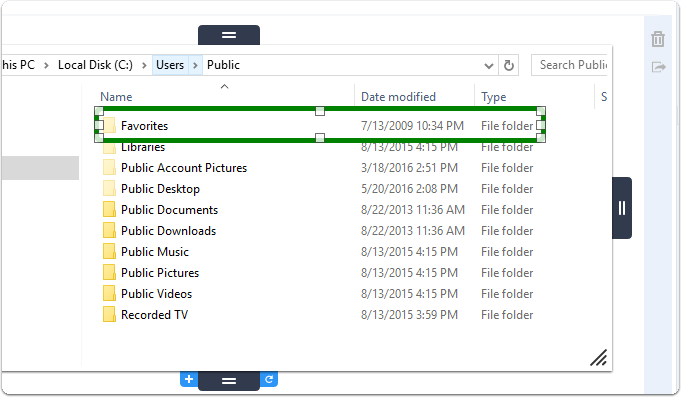 This won't affect your saved annotation presets. The settings will be reset and the annotation preset menu will be set to None. You can apply an existing annotation preset to all annotations in an article or just the selected annotation. 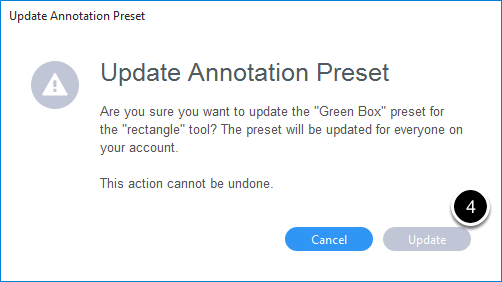 To apply a preset to specific annotations begin by selecting the annotations you want to change. Select the annotation preset you would like to apply. 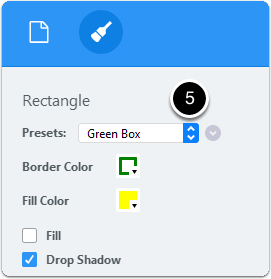 All of the selected annotations will have their properties changed to match the preset. 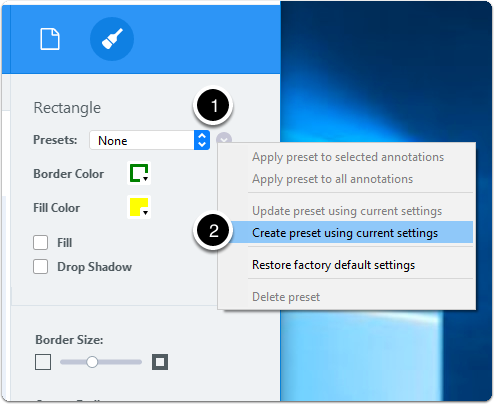 If you want to apply an annotation preset to all annotations of a particular type you can do so using the annotation preset option menu.